Recently I was contacted by a reporter asking whether I’d be willing to participate in a piece on what it’s like to have a mastectomy. Would I share my experience and story? Of course, I said yes! My goal is to put it all out there with the hope to help others in some way. There were a number of women who also provided feedback for the article that was published on Prevention.com. Check it out! It’s not a term most of us would choose to describe a double mastectomy, but she’s not wrong. After all, an amputation is the surgical removal of an extremity; a mastectomy is the surgical removal of a breast. Thinking of the two procedures as one in the same could drastically change our perception of breast cancer treatment. This entry was posted in All, My Story on April 29, 2016 by nope2BC. It has been over three years since I started this process. On January 22, 2013 I underwent a prophylactic bilateral mastectomy to greatly reduce my risk of developing breast cancer and started breast reconstruction. Since then, I had a few complications, due to which the process took much longer than planned. On March 1, 2016 I had my 9th surgery. Fun stuff! Honestly, at this point, I’m tired of talking about it (and feel like my friends and family are tired of hearing about it too). I figured I should at least tell you boys and girls, since it is part of my process and well, this is what the blog is for: to document my journey. What I thought was my last procedure was in July 2015, when we swapped the expander on my right with an implant. After that surgery, I received IV antibiotics for a month (see post: PICC life). Things cleared up and three months out I went on vacay to Mexico, where I finally was able to wear a bikini without an expander! I enjoyed being done and was very much relieved. Shortly after, I noticed a bit of a divot above my right side. At the time I thought: no biggie, things take time to settle and it wasn’t really that bad. Over the next couple of months, the divot got deeper and the implant dropped lower. By January I knew that the implant had bottomed out and surgery was the only way to fix it. After consulting with my plastic surgeon, I scheduled the procedure. Over the next two months I went back and forth on whether I would actually have it. On one hand, I was displeased with the outcome and did not like seeing it in the mirror; on the other, I have experienced multiple complications and was afraid of the possibility of more issues. I had it. The PS did a pocket revision; easy surgery and super easy recovery. Although the tone of this post may not be entirely positive, I am in a good place. I feel great and still have no regrets about having the PBM. Somebody told me that it wouldn’t be easy and they were right. Totally worth it, though. However, I won’t say I’m done, because I’ve already declared that a couple of times and was wrong. We shall see where this goes. So far everything looks good. This entry was posted in All, Complication City and tagged bottom out, BRCA, Breast implant, breast reconstruction, Complication, HBOC, health, pocket revision, Previvor, Prophylactic mastectomy on March 18, 2016 by nope2BC. Do you know that most insurance providers (in the US) cover post-mastectomy bras for women who have undergone a mastectomy? There are limitations, deductibles and co-pays still apply, and you might have to jump through some hoops. More info below photos. I get six bras and six camisoles per year under my current plan. I recently visited a local mastectomy boutique for a fitting and left with four Coobie bras, two Anita bras, and two camisoles (+ third on order). I will return in the spring when Amoena releases new colors and styles to pick up three more camisoles. The experience was relatively hassle-free and since I already met my out-of-pocket maximum for the year, they were all covered at 100%. I started by calling my insurance provider to check level of coverage and to request a list of providers. Post-mastectomy bras are considered medical devices (the code is L8000), so I got a list of places that sell all kinds of devices, which didn’t really help. Then I contacted a local mastectomy boutique: 1. to ask if they work with my insurance provider, 2. determine what I needed to do before I came in, and 3. to make an appointment. I provided my surgeon’s contact information and my insurance details. The boutique reached out to my plastic surgeon and obtained the required prescription and details. They also contacted my insurance provider and secured pre-authorization. A week later I got a call that all was set. They really made it easy. Some insurance providers work with stores like Nordstrom (appointment required). Those that don’t may reimburse after the fact. Also, stores carry different stock, so if you want Coobie bras, you may need to call around. Keep looking until you find a place that works for you. There are options. Nordstrom will even remove underwires for free (so I hear). This entry was posted in All and tagged Anita, breast reconstruction, camisole, Coobie, health, insurance, medical device, Plastic surgery, post-mastectomy bra, Prophylactic mastectomy on December 11, 2015 by nope2BC. I never really worried or thought much about cancer … until my sister was diagnosed with breast cancer at the age of 28. At the time, I was 21 years old, naive, in college, worried about what plans I had for the weekend, and didn’t really grasp what that meant. More than ten years later, my sister is gone, my mom is gone (ovarian cancer), my aunt is in treatment for colorectal cancer, my other sister just had her own scare, and although I am BRCA mutation uninformed negative, I underwent a prophylactic bilateral mastectomy and started the breast reconstruction process on January 22, 2013. 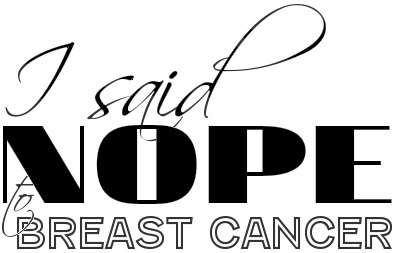 I said NOPE to breast cancer. Making the decision to undergo such a drastic surgery was both very difficult and extremely easy at the same time. It came after 10 years of vigilant screenings, when anxiety gripped me every six months as I prepared for my sonogram, mammogram, or MRI, anticipating the results to be the worst. When a screening discovered suspicious lumps, I knew that the time had come. The reconstruction process was long, painful, and complicated (documented here on my blog). More than two years and eight surgeries later I can finally say I am done! No regrets. If I had to go through this all over again, knowing what complications were in store, I would make the same decision in a heartbeat. It is not the right answer for everyone facing breast cancer and one that should not be taken lightly or made without research, consulting with experts/doctors, considering alternative options (screening, chemoprevention, holistic approaches, lifestyle changes), and understanding the consequences. There are many resources out there that can help. The My Destiny Foundation and its Facebook support group has been there for me for the last three years, since the days I was making surgery prep lists and had lots of unanswered questions about my upcoming procedure and following recovery. The group is a family of strong women from all over the world that support each other, laugh together, cry together, and everything in between. Visit www.mydestiny-us.com to learn more. If you need support, request to join the Facebook support group. See you there! This entry was posted in All and tagged BRCA, breast reconstruction, HBOC, health, Hereditary cancer, high risk, My Destiny, Prophylactic mastectomy, Support group on October 1, 2015 by nope2BC. This entry was posted in All on September 27, 2015 by nope2BC. 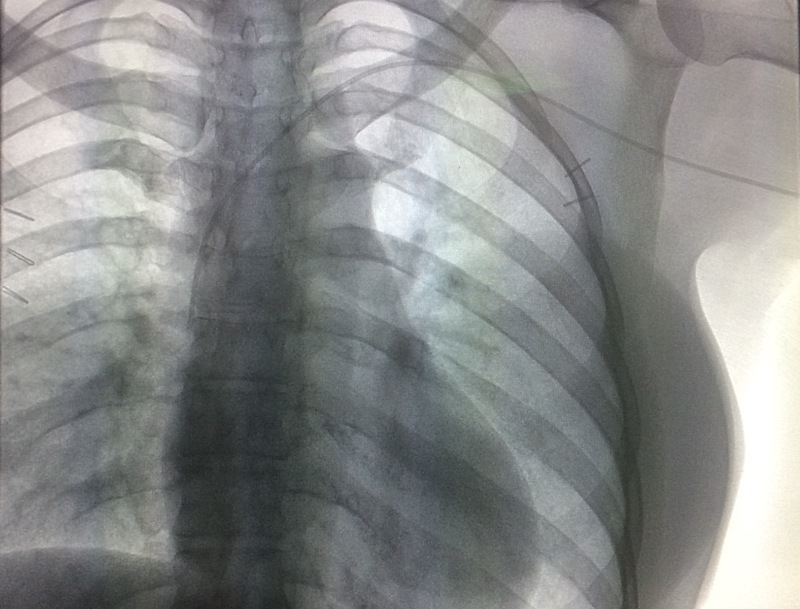 It has been four weeks since I got the PICC (peripherally inserted catheter). That’s how long I have now been on IV vancomycin. I have been cranky and frustrated. Following my most recent surgery two months ago, I developed a spot of redness. The cause was a mystery. No fever, swelling, discharge, or open wound. An ultrasound didn’t tell us much. Suspecting an infection, my doctor and I agreed that antibiotics were the way to go. Two different oral types didn’t help, so we moved to the big gun, vancomycin, which is a broad spectrum antibiotic often used to treat staph. I was willing to try anything to avoid another surgery and potential implant removal. Been there, don’t want to do that again! The vanco would be delivered intravenously, so I visited the hospital’s intervention radiology department and had a PICC inserted into my upper arm. I was told I would not need to be hospitalized for this treatment and sent on my way. Later that day I had a delivery of supplies and meds (holy moly, it was a lot of stuff). In the late evening a nurse came to hook me up to my new best friend. I chose to have an electronic pump deliver the meds on a programmed schedule, rather than administering the doses myself. This meant I would be lugging it all around with me 24/7. My fridge was full of meds and my dining room table became the supply station and the place where every couple of days I sat with nurses that visited me to draw blood and change dressings. Over the course of four weeks I had 79 infusions and 13 visits by 7 different nurses. For showers, I had to plastic wrap my arm and bathe using only the other one. Initially this was a two week gig, but when the progress wasn’t satisfactory, we extended the treatment for another week, and then one more. Throughout I kept my doc updated via emails and photos. There were a few office visits in there too. My insurance covered all this at 100%. At this point, I am not confident that what we are doing now is really helping, so we are going with #2. It is possible this isn’t an infection. We discussed this at the very beginning, but then it seemed like the best explanation. Since I had no open wound, we weren’t able to get swabs for cultures and I was not a fan of going in there as mentioned above. If this was an infection, the vanco would’ve nixed it by now. What exactly is going on, we don’t know for sure. It may be happening due to the physical stress on the tissue or some other thing we haven’t thought of. My body is weird … the various complications from the last three years are proof. But for now, I am free of the pump and bag! To celebrate, I had lunch with friends and went bathing suit shopping for an upcoming trip to Punta Mita, Mexico. I can’t wait to lay on the beach and think about my next margarita instead of my next infusion. Fingers crossed that this will resolve over the coming days/weeks. It’s the last hurdle before I cross the finish line. This entry was posted in All, Complication City and tagged BRCA, breast reconstruction, Complication, HBOC, health, infusion, MRSA, picc, Plastic surgery, Previvor, staph infection, vancomycin on September 19, 2015 by nope2BC.